This is part 2 of the series of comparisons. Click here to read PART 1. Now that we are done with checking out the outlook, let’s find out the difference on Homescreen, Phone and Messaging modules on both devices. The Lumia 900 has a homescreen with Live Tiles that flips, which act as the shortcut/widgets to the respective apps in the phone. Tiles can be rearranged anyway you want. Just tap and hold, drag the tiles and they can either be placed anywhere or ‘unpinned’ from the homescreen. The SIII runs Ice Cream Sandwich and as we all already know, there’s a dock with 5 shortcut icons at the bottom and maximum of 7 different panels for widgets which you can add by tapping and holding on the background wallpaper on the homescreen. Here are the 4 buttons which we can see on the Phone module for both the devices. 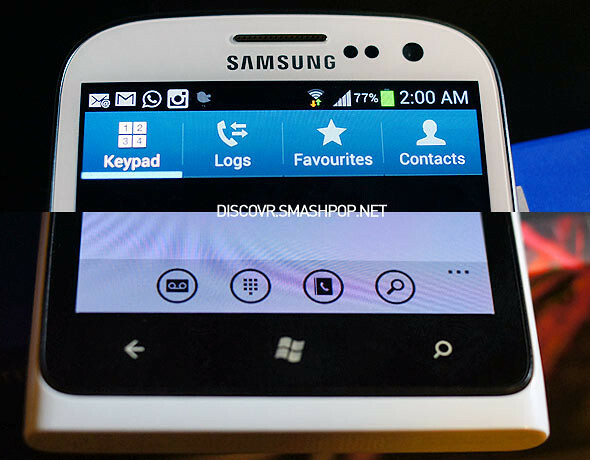 [Keypad, Logs, Favs and contacts] on the S3 and [Voicemail, Keypad, Contacts and Search] on the Lumia 900. Both the keypads look very clean and massive. 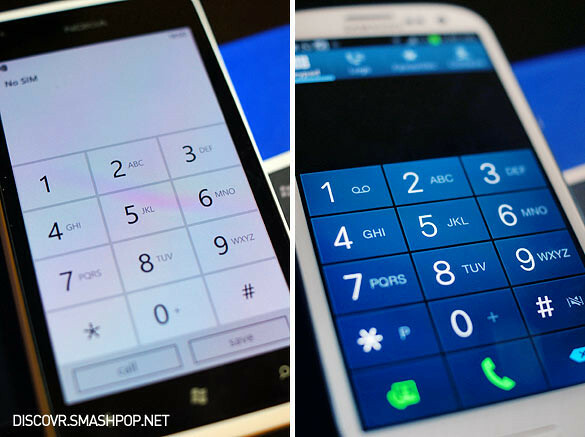 With the Metro UI style on the Lumia 900, the keypad screen is very simple and minimalist. There isn’t must to talk about here. Lets move on to the Messaging module. 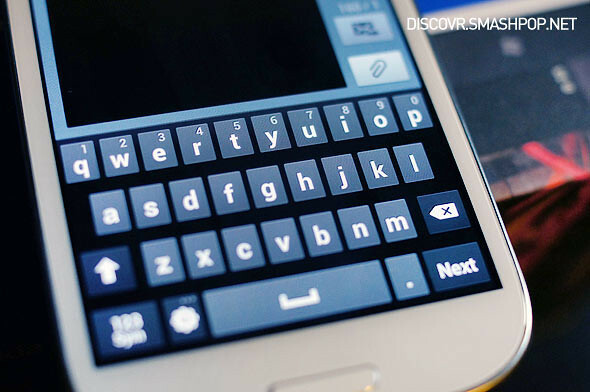 This is how the SMS conversation list looks like on both devices. Conversations are called ‘threads’ on the Windows Phone. 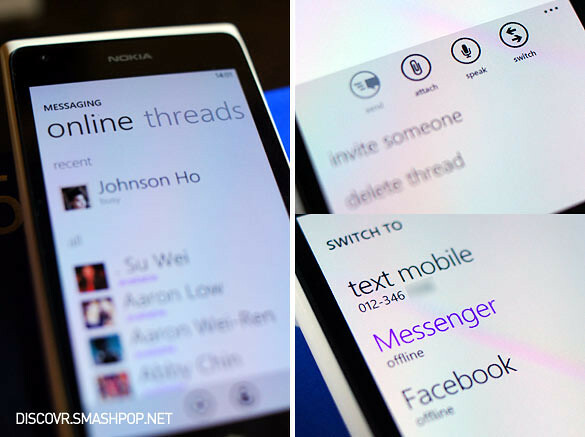 The Lumia 900 really excels here as the Messaging hub does not only work with SMS, it is also intergated with Facebook Chat and Live Messenger (MSN). The Galaxy SIII has a new feature too. When you are looking at your conversation with .. say.. Friend A. Hold the phone up to your ears and the phone will dial Fried A’s number straight away. Saves a few second from tapping the name and then press ‘call’, like how you’d do on any phone. On the Messaging hub on the Lumia 900, we can see 2 tabs(pivots): Threads & Online. Swiping to the right will show us a list of friends who are online on either MSN or Facebook Chat. Their status are also listed below the respective names. Now you can chat with .. say Friend B, no matter where they are. 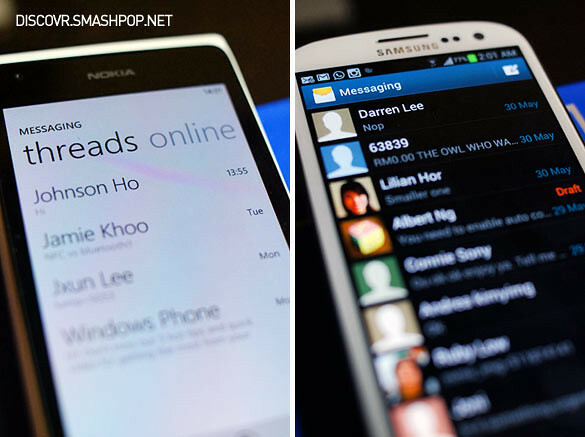 Seamlessly switch among SMS – Facebook Chat – MSN by simply tapping the ‘switch’ button at the bottom of the screen. Thumbs up for this integration. The keyboard on the Lumia 900, though very basic, works really well in learning words and the autocorrect just seems more comfortable to use. We quite like the typing sound effect as well. 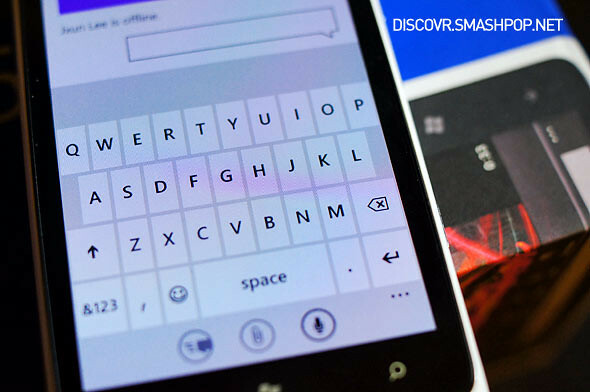 As good as it can be, we are a fan of Swype and we hope Microsoft will integrate the swiping gestures to its keyboard in the future. Now…. 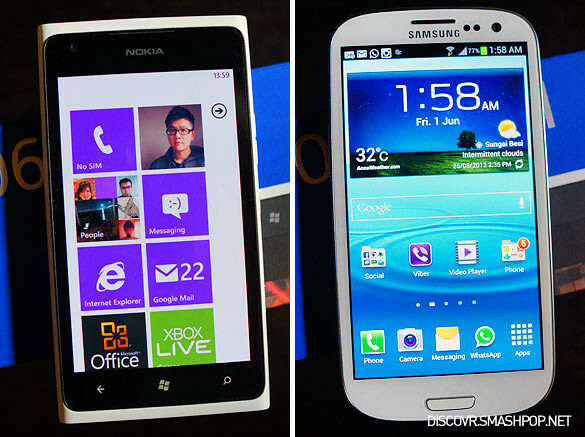 check out the full video of the comparison between Galaxy SIII v Lumia 900 in terms of Homescreen, Phone and Messaging NOW! Which device do you prefer? SIII? Lumia 900? Let us know by leaving a comment below! 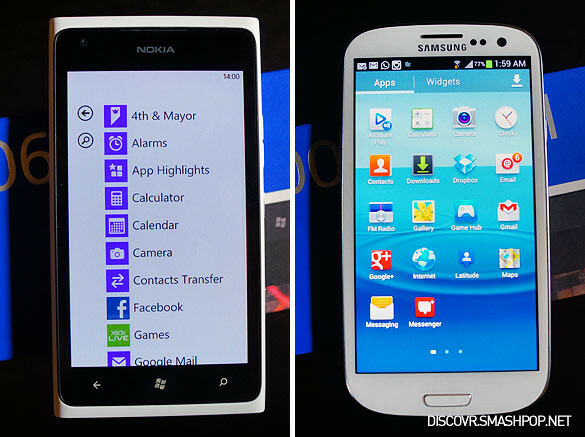 3 Responses to "Samsung Galaxy SIII vs Nokia Lumia 900 Pt.2: Homescreen, Phone, Messaging"